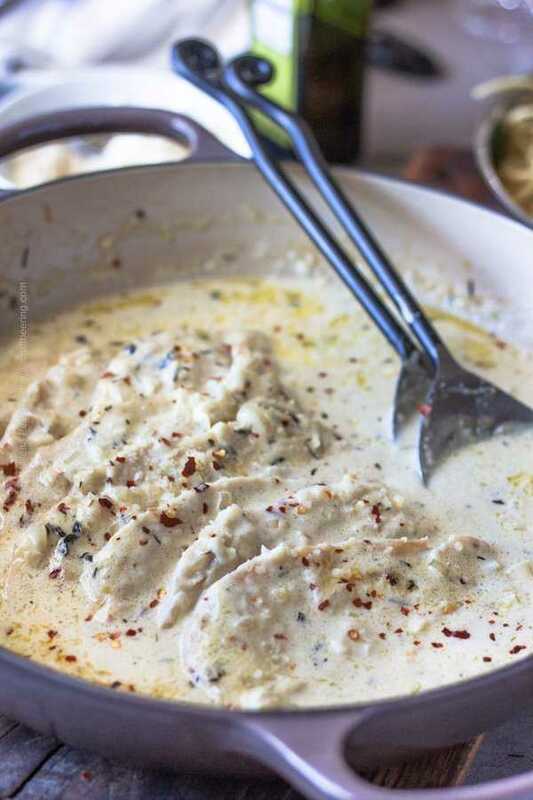 Chicken cutlets in a crazy delicious, creamy sauce with shallots. Easy to master and equally good when served with pasta, mashed potatoes or rice. First things first – what is the difference between a chicken cutlet and a chicken breast? Chicken cutlets are thin slices of chicken breast meat. As opposed to cooking the whole breast, you are looking at a filleted section of it that is about three times thinner. If where you shop precut chicken cutlets are not available you can easily carve your own at home. 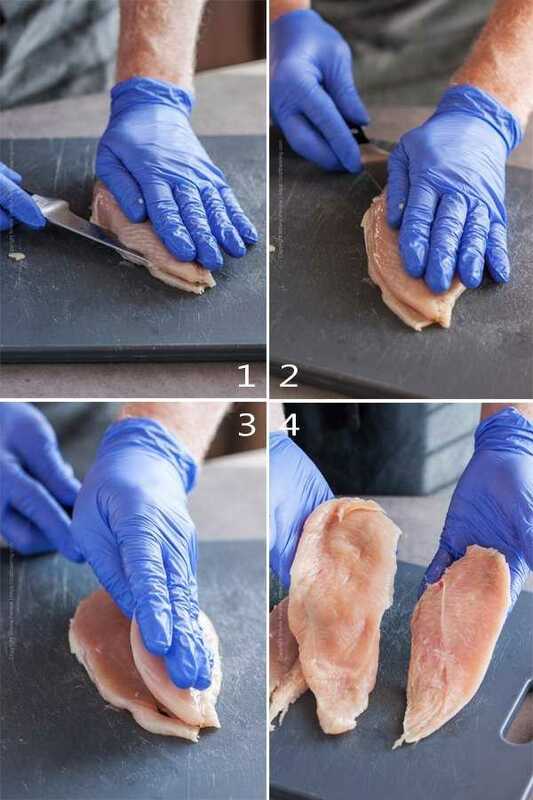 Refer to our step by step tutorial under the recipe card demonstrating How to Cut Chicken Breast into Cutlets. There are few limitations on how you can cook chicken cutlets but for simplicity – most of the possibilities fall into one of two main groups – pan seared or breaded chicken cutlets (fried or baked). The former are typically presented with a tasty pan sauce, like these roulades. The goal with the latter is to make them as crispy as possible. 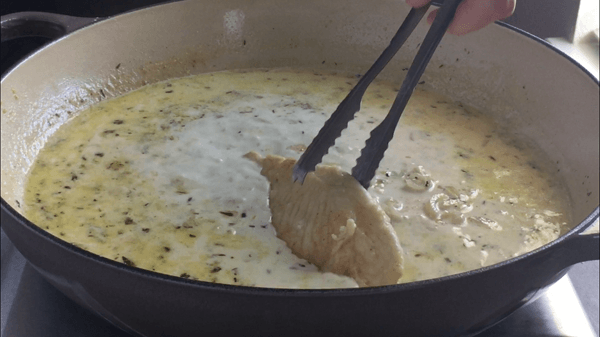 This chicken cutlet recipe is for juicy, tender pan seared fillets in a scrumptious (and quite plentiful) creamy sauce. 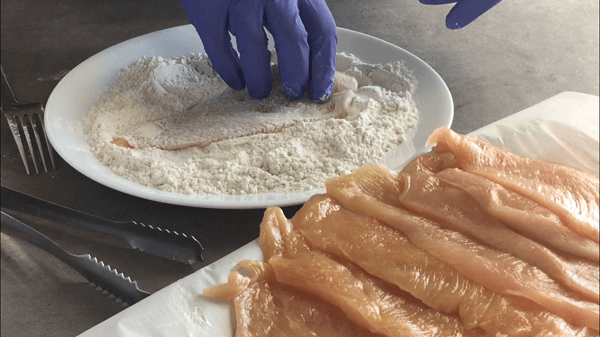 If breaded chicken cutlets are your goal – refer to our step by step instructions and video for chicken schnitzel. Because a chicken schnitzel is essentially a breaded pan fried chicken cutlet. With a fancy name. 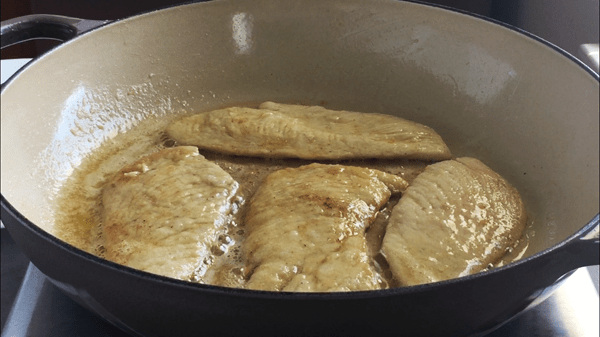 You can make pan seared chicken cutlets entirely on the stove. You will need a roomy, deep skillet – for best results choose one that is cast iron, stainless steel or an enameled braiser. 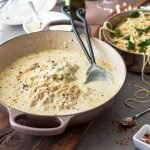 The few simple ingredients for this recipe besides the chicken cutlets include flour, salt & pepper, butter, olive oil, shallots, garlic, thyme, chicken stock and cream. 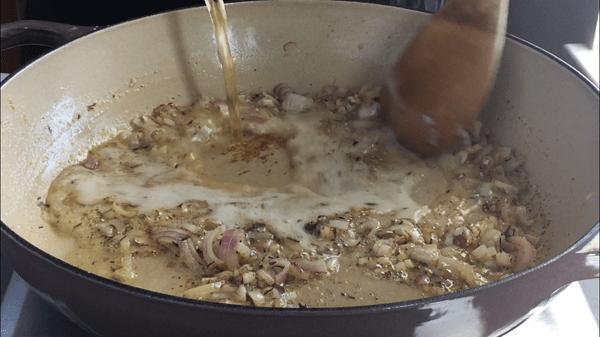 If you don’t have shallots, substitute with red onion or leeks. Optional for extra flavor – a splash of dry white wine or even better Bohemian style pilsner to deglaze the pan. Cooking with beer has its indisputable benefits. 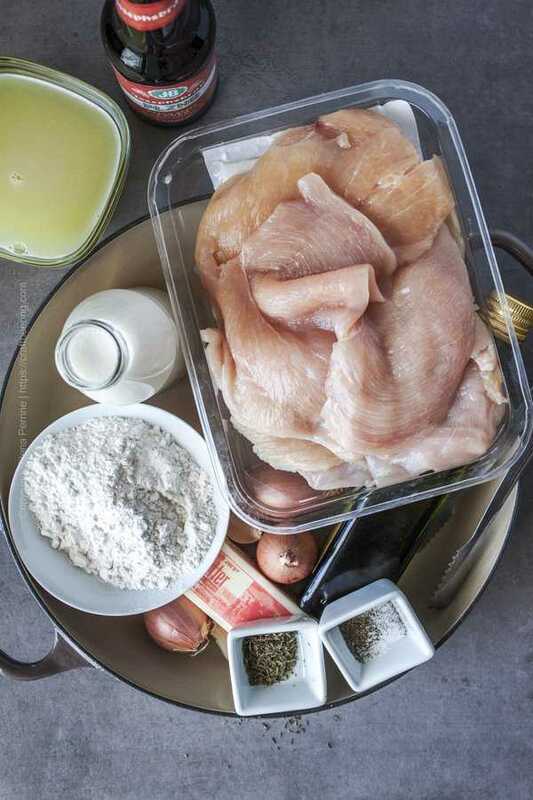 Mix flour, salt and pepper and dredge each chicken cutlet. Next heat butter and olive oil in the pan and sear the flour coated cutlets on each side. Take them out and set them aside (they are not completely cooked at this point). 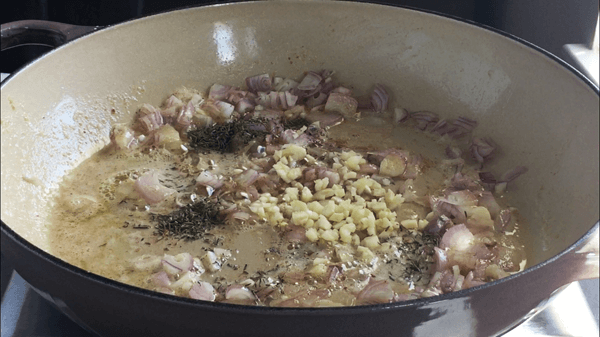 Add another lump of butter to the pan, another drizzle of olive oil and saute the shallots and garlic, seasoned with thyme, salt and pepper. Deglaze with a bit of chicken stock (or sweet Czech pilsner if you are up for it), scrape off brown bits from the bottom of the pan and then add chicken stock and simmer to reduce. 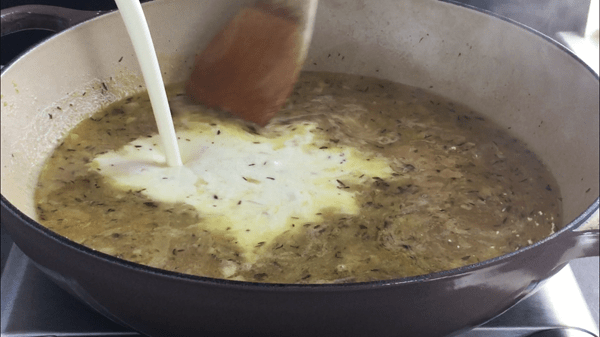 Once the stock is reduced by half add cream, stir, add the chicken cutlets back to the pan and simmer for a few more minutes to finish cooking the chicken and marry all the flavors. You are done!! Season with Parmesan and/or red pepper chili flakes. NOTE: This is just one idea for sauce to go with pan seared chicken cutlets. You can simmer them in whatever sauce you choose. For more options see below the recipe card. Thin chicken cutlets in delicious pan sauce. Less than 30 minutes to a scrumptious chicken dinner. In a shallow bowl or plate mix flour, pinch of salt and pepper. Dredge the chicken cutlets and shake off excess. 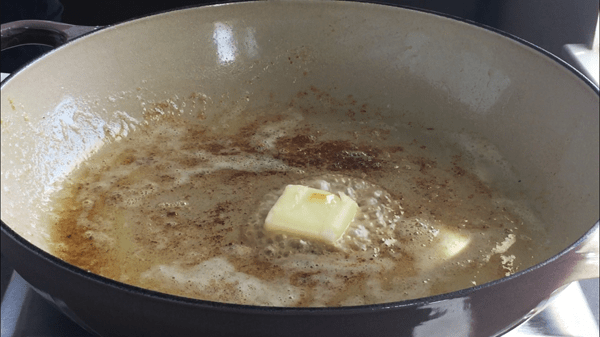 In a large cast iron or stainless steel skillet over medium high heat melt 1 tbsp butter + 1 tbsp olive oil and sear four of the cutlets until golden brown on each side. Remove from pan, add butter and olive oil and repeat for the next four cutlets. Bring the heat down to medium, place last 1 tbsp or butter and olive oil in pan and saute (about 3 mins) the shallots, garlic, thyme and season with salt and pepper to taste. Deglaze the pan with a bit of beer/wine/stock and scrape off brown bits. Add chicken stock, bring to simmer and let reduce by half. Add the cream, stir, add all the chicken cutlets and simmer for about 8 minutes until sauce thickens and cutlets are fully cooked. Serve family style with pasta, mashed potatoes, rice or roasted veggies. *You can fillet chicken cutlets from a chicken breast at home. Consult the picture step by step instructions below. **Use chickpea(garbanzo) flour as a gluten free alternative. Nutritional information is based on serving size using 2 cutlets per person, average weight of 2.5 oz each. If you do not have the time to create a sauce from scratch you can always use a jar of your favorite marinara or Alfredo. After you sear each side of the cutlets, remove them, deglaze the pan with a bit of water/beer/wine, add the sauce to the pan, stir, add back the cutlets and let them simmer until fully cooked. 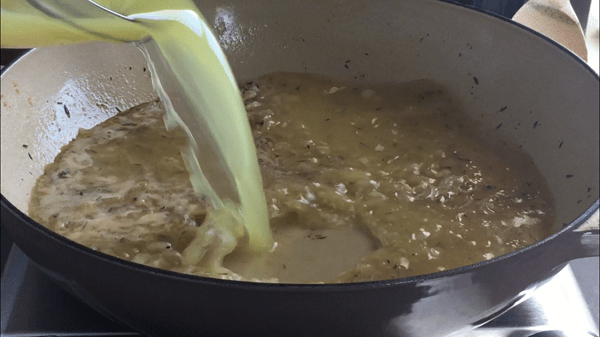 Or mix equal parts of honey and mustard, add cream, season with salt and pepper and you’ll have a delicious honey mustard sauce. Also consider this recipe for scrumptious Chicken Beersala with mushrooms, doppelbock and fresh thyme. What to Serve with Chicken Cutlets? Besides pasta (I love to fold in a couple of cups of fresh spinach and drizzle some olive oil over just cooked al dente spaghetti) this dish goes really well with mashed potatoes or wild rice. Because the sauce is quite plentiful gnocci are a great alternative to pasta as far as mopping up delicious sauce goes. If you opt to roast a medley of veggies in the oven while cooking the cutlets on the stove top – that’s another great option. Tons of possibilities really, depending on your sauce of choice. Before you begin select a sharp knife. This is critical. Everything will be a breeze if your blade is sharp. If you are not too confident in your knife skills it will be helpful to use a wider blade such as a chef’s knife versus the boning knife Chris is using in the pictures. TIP: Additionally, a semi-frozen chicken breast is much easier to slice through horizontally, so if circumstances allow, plan accordingly. Start by removing the chicken tenders from the whole breast. 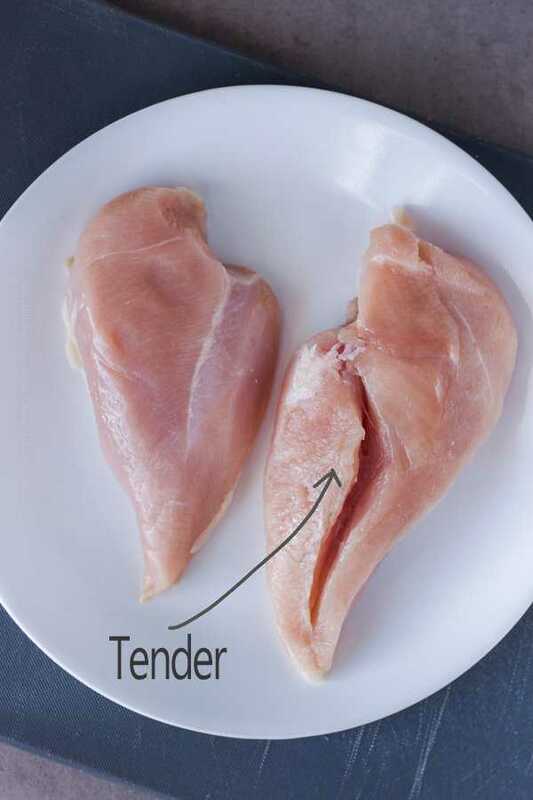 We slightly separated one of the tenders in the picture below so you can easily identify it. Reserve the tenders for another meal. To remove the tender follow the four steps pictured below. 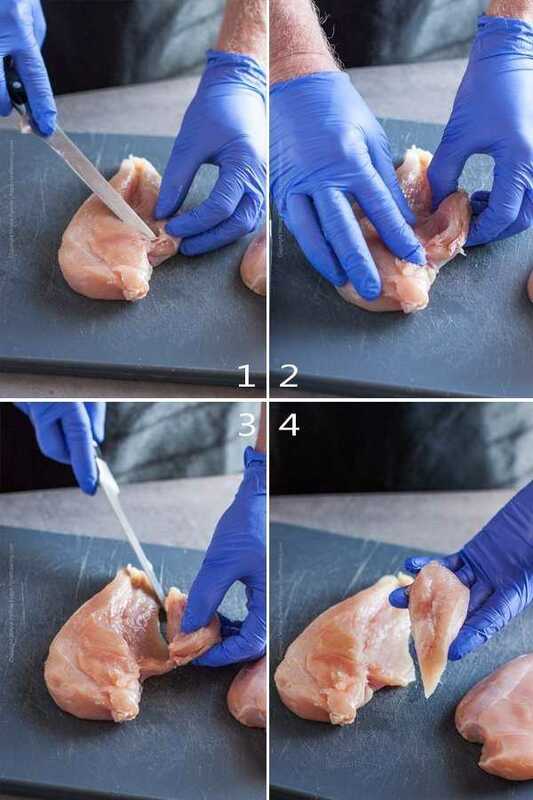 Cut through the upper point of attachment to the breast (#1), pull the tender to the side gently to begin separating it (#2) and cut through the lower point of attachment to the breast (#3). Next, proceed to fillet the chicken breast into cutlets. As you perform this motion gently separate the top layer of meat (#3) and slice all the way through. You now have raw chicken cutlets (#4). Store bought chicken cutlets are filleted mechanically so yours might look a bit less uniform (unless you practice daily and become abnormally good at executing the above steps). Don’t worry about that – you can always thin out the cutlets further by pounding them a few times with the flat side of a meat tenderizer or the bottom of a skillet. If you do this – first cover them with plastic wrap or a zip lock bag. That looks so delicious!! Pinned. Look at all that delicious sauce you created…the chicken has to be wonderful. Truth be told, I could eat chicken cutlets 3 times a week…at least! 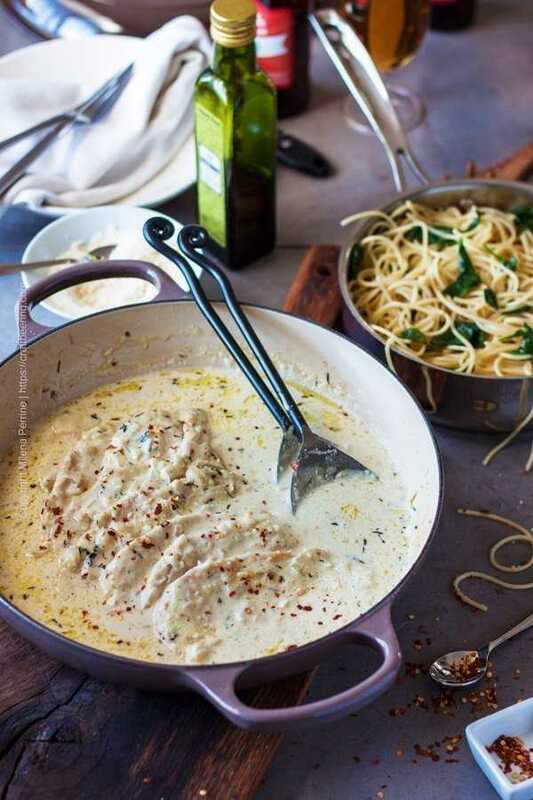 And this creamy sauce looks divine!! Thank you, Dawn! I am sure it will taste good with some breakfast chicken patties and biscuits, lol. This looks so inviting! 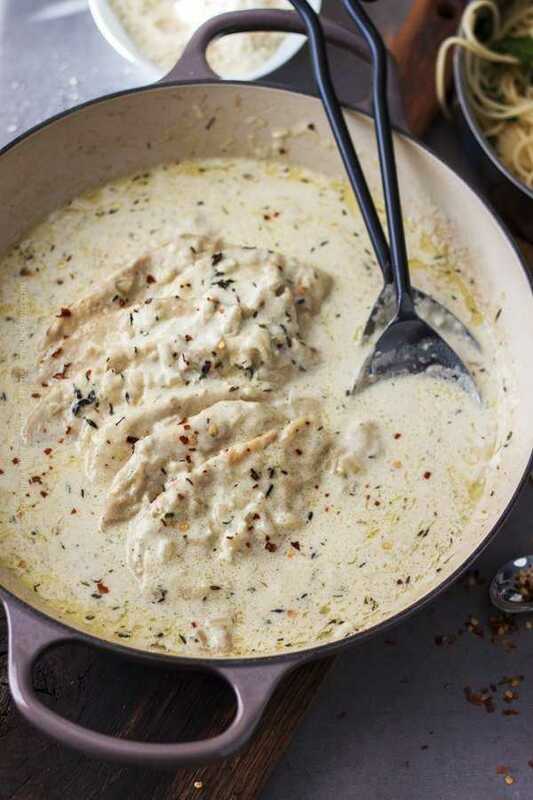 Love that creamy sauce and chicken cutlets are such a quick and easy choice! Thank you, Kelsie! Yes, we love shallots as well for the exact same reason.